Most people are aware of Custer's defeat at the Battle of the Little Bighorn in the 1870s. During that battle 268 men were killed and the nation mourned when they learned of this loss. Almost 100 years earlier there was another battle fought on America's frontier, the Ohio Territory along the Wabash River not far from where Grand Lake is located today. During this battle, 900 American soldiers and scouts were killed in a single battle. It would be the largest defeat of American soldiers in the history of the army against Native American forces. Native Americans inhabited and used much of the land in the Ohio valley as hunting grounds. As American settlers pushed west, conflicts resulted and attempts at peaceful settlement failed. Under political pressure, President George Washington resolved to subdue Indian resistance to American expansion in the Ohio country and appointed General Arthur St. Clair to lead a military expedition into the frontier. This would lead to 2 of the largest battles ever fought between American and Native American forces. St. Clair's troops numbering around 1200 men were camped on the Wabash River (just east of the Ohio-Indiana state line) after an exhausting two-month trek from what is now Cincinnati. The weather was turning cold and they were facing the prospects of spending a long winter in the field. With that in mind, perhaps some of General St. Clair's men were grumbling amongst themselves that the general may not be the right person to lead them when 1200 Miami, Shawnee, and Delaware Indians began a well-organized attack during the early morning hours on November 4, 1791. By the end of the day the warriors who were being led by Little Turtle and Blue Jacket had either killed or wounded nearly 900 of the Americans including Major General Richard Butler, who remains to the day as being the highest ranking army official killed in battle. Overall, it was the worst-ever defeat of the U.S. Army by Native Americans in a single battle. This was the history of the area and President Washington had a problem. He needed to gain control of country's western frontier before the British could establish a strong foothold here along with many of the Native American's who saw the new American republic as an ever growing threat to their influence over the land. With St. Clair's defeat, Washington made the decision he needed a stronger, better trained force that would not make the same mistakes. He asked his old Revolutionary War friend General Anthony Wayne, to come out of retirement and head the U.S. Army. General Wayne spent some time organizing and training his new army before leading them into what was sure to be a heated conflict. Well organized and disciplined, Wayne's army left Fort Washington (now Cincinnati) and made its headquarters at a location where Wayne established the largest fort ever built to date that he named Fort Greene Ville. In December 1793, General Anthony Wayne sent an artillery unit and 8 infantry companies to the site where St. Clair was soundly defeated. Here they were to build a fort on the former battlefield. Wayne intended to use this fort as a staging area for his assault against Ohio natives when the weather warmed the following spring. 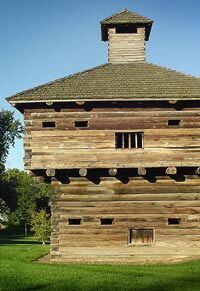 He named the stockade Fort Recovery. 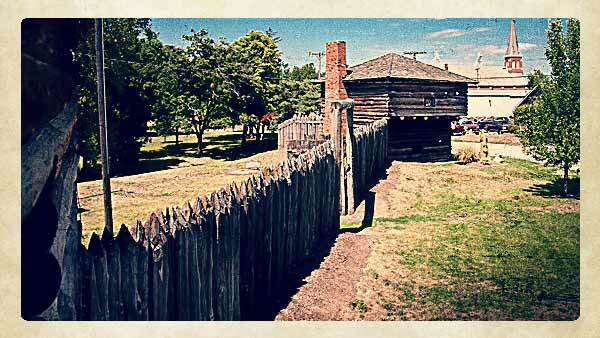 Once the fort was completed, Wayne spent the remainder of the winter moving additional soldiers to the fort. The Shawnee, Miami, and Delaware Indians all feared the presence of the Americans and sent representatives to Fort Recovery to ask for peace. Wayne demanded all native chiefs in the surrounding area attend a peace conference and that the Indians return any white captives that they currently held. Fearing for their own safety and not trusting the Americans, the natives refused this demand. Instead they prepared to isolate the fort. By attacking the garrison's supply lines stretching back to Fort Washington, they figured they could starve the Americans, forcing them to abandon the fort. That June, 1,500 Shawnee, Delaware, Ottawa, Miami, and Ojibwa Indians attacked a pack train returning from Fort Recovery to Fort Greene Ville. Little Turtle, Blue Jacket, and Simon Girty led the assault. The attack was made less than 1000' from Fort Recovery. Of the 140 American soldiers escorting the wagons, the natives killed or wounded 15. They also seized 300 horses. Indian casualties amounted to 3 dead warriors. Soon after this attack, the Indians, emboldened by their success, launched a night attack against Fort Recovery. Inside the stockaded fort, 250 American soldiers succeeded in defending against the night assault, but losing 22 men. The natives suffered 40 dead and 20 wounded. After this assault, the Native Americans were forced to withdraw further north with General Wayne pursuing. Fort Recovery then became another foothold in the lengthening supply line that would eventually reach almost to Lake Erie. Later that summer in August, the Battle of Fallen Timbers was fought along the Maumee River. It was this decisive battle that most of the Indians realized they had little chance in stopping the American settlement of their lands. A year later in 1795, many Native Americans, although reluctantly, agreed to sign the Treaty of Greeneville. By signing this document, they officially gave up all claims to the land south and east of a line extending from Lake Erie south along the Cuyahoga River, to the Tuscarawas River, and then to Fort Laurens. From Fort Laurens, the line ran west to Fort Loramie, then northwest to Fort Recovery, and then straight south to the Ohio River. 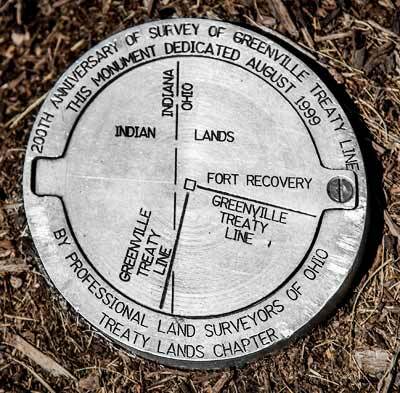 ABOVE: Surveyors mark installed on the 200th Anniversary of the Greenville Treaty located just outside of the partially reconstructed Fort Recovery western wall indicates the exact location of the northwest corner of the Greenville Treaty Line. Through General Wayne's organized military expeditions, he had secured from the natives the majority of modern-day Ohio with the exception of the extreme northwestern corner of the state. This land would later be taken at the conclusion of the War of 1812 when many of Ohio's Native Americans once again sided with the British / Canadians in an attempt to defeat the Americans. The Treaty of Greeneville opened the Ohio Country for peaceful settlement and lead to Ohio's statehood 8 years later in 1803. 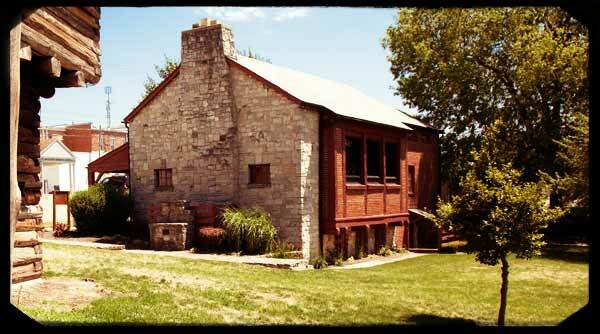 Fort Recovery is located about 20 miles southwest of Grand Lake St. Mary not far from the Ohio / Indiana border. The city of Fort Recovery stands today on the site of the frontier fort. The museum features Anthony Wayne’s legionnaires and a typical Native American from the 1790s. Life size mannequins show an officer & artillerymen operating a Howitzer cannon, an infantryman making use of the stockade, and a dragoon complete with his horse. Information and maps explain both the Harmar and St. Clair campaigns along with a detailed explanation of Wayne’s campaign and the construction of the fort. The original flagstaff from the fort as well as many artifacts from the 1790 campaigns are proudly displayed. Fort Recovery was a pivotal point on the Greenville Treaty Line. Visit the balcony to see a large display of prehistoric artifacts found in the local area. Artifacts date back to 14,000 years B.C. This is one of the largest displays of prehistoric arrow points, spear points, and stone axes in Ohio. The gift shop has numerous books, maps, postcards and other items relevant to Fort Recovery. 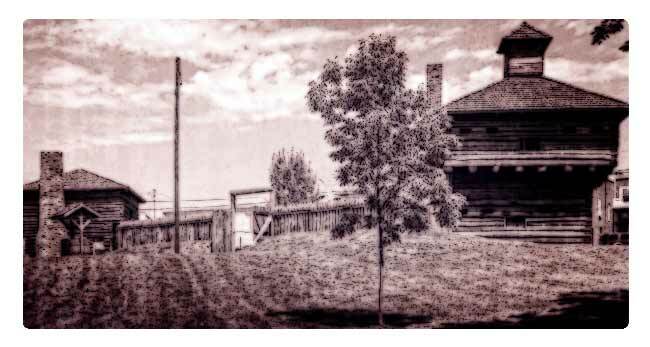 ABOVE: Fort Recovery Historical Society Tool Cabin. 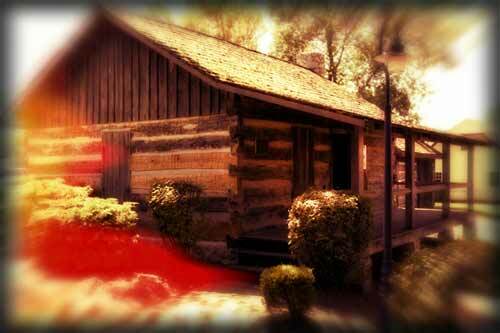 Along with the museum are several relocated 1840 log houses, one of which has been turned into what a typical blacksmith shop might have looked from the early 1800s. 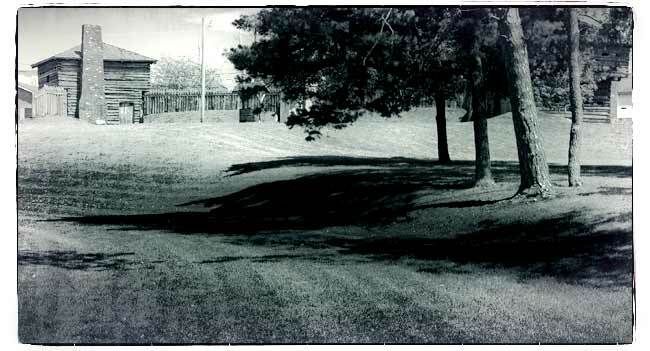 ABOVE: The depression in the foreground of this photograph shows the actual river bank of the Wabash River at the time Fort Recovery was constructed. In the early 1900s the river channel was changed moving it further west.